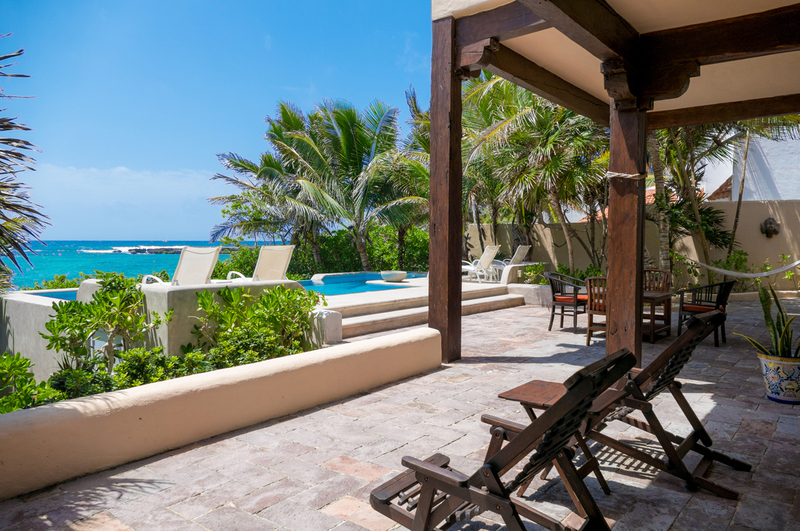 Located on the Caribbean Sea, the unspoiled views from Villa Las Vigas are some of the finest on the Riviera Maya. 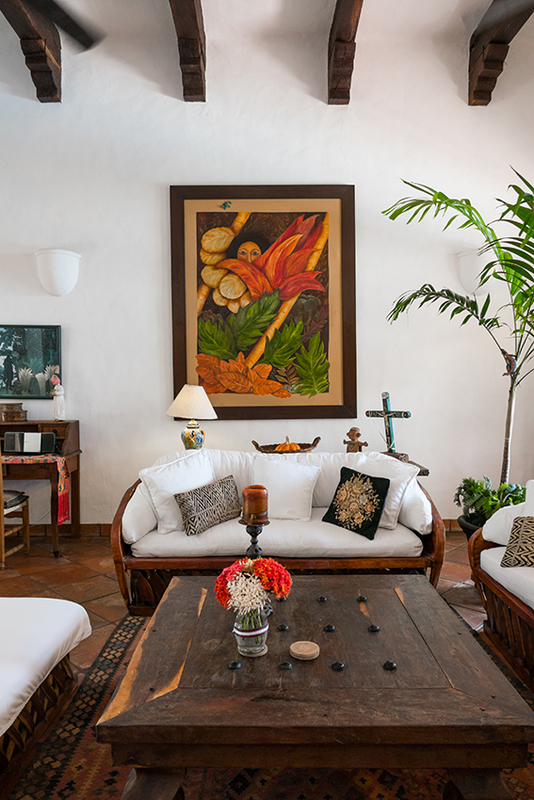 Tucked away amongst lush tropical foliage, this luxury vacation home offers romantic privacy like no other in the quaint village of Akumal, Mexico. 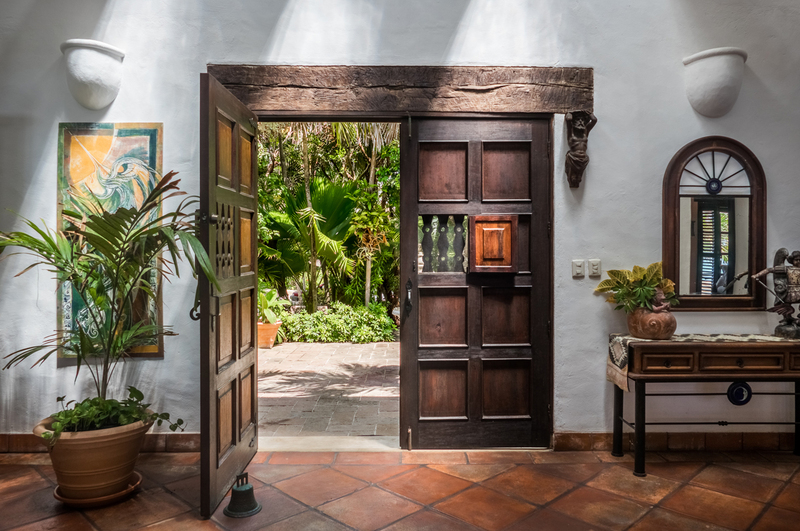 Built by a Mexican architect who visited New Mexico for inspiration, the villa has a Santa Fe style exterior while the interior is decorated in a mixture of Santa Fe, Mexican, Spanish and Italian. 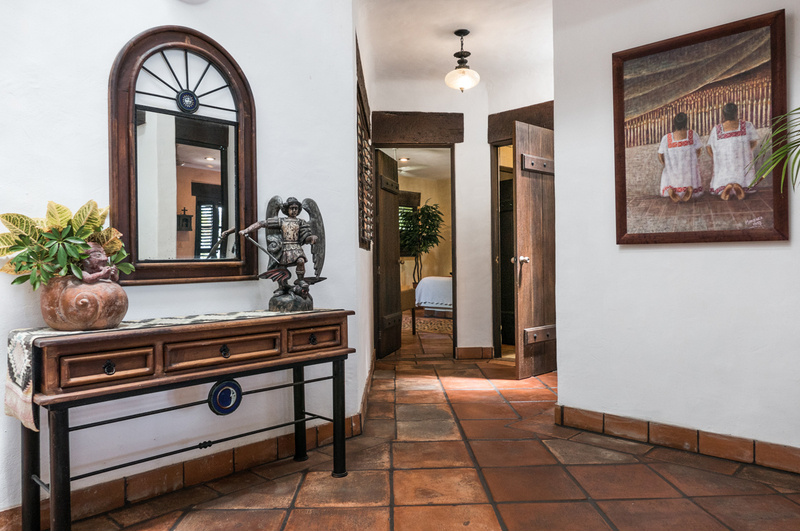 Villa Las Vigas is the owners "dream home". 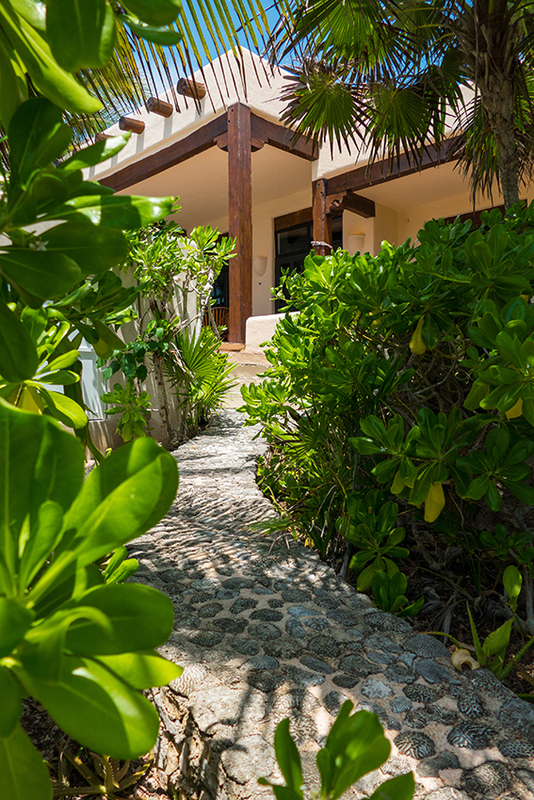 Villa Las Vigas is 20 mins to Tulum, 15 minutes from Puerto Aventuras and 30 mins to Playa del Carmen, by car! 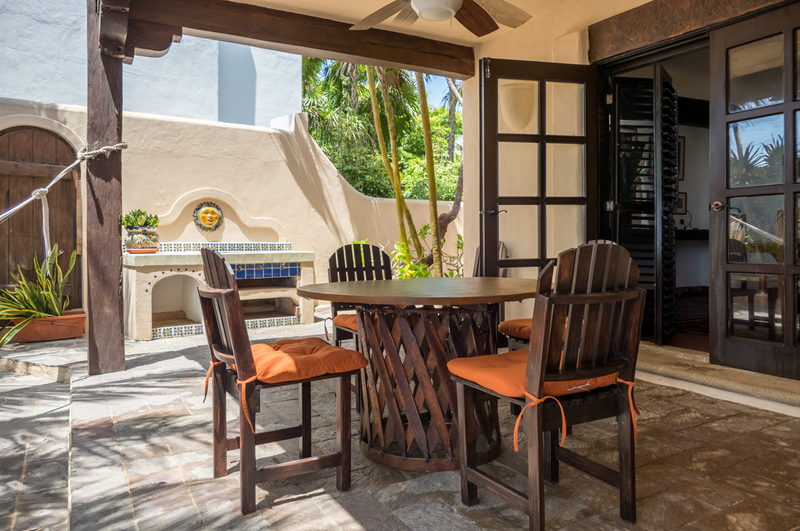 Beyond a series of decorative French doors lies a view that captures the beauty offered exclusively on the Riviera Maya. 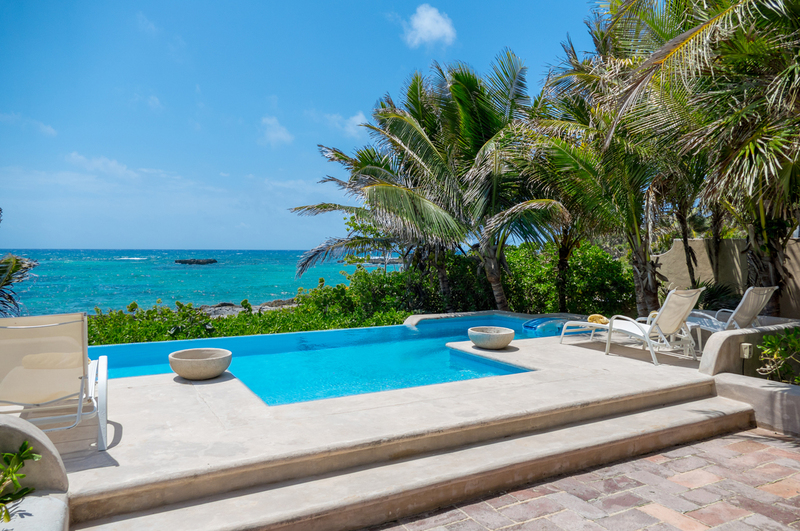 As Villa Las Vigas is located directly where the majesty of the Caribbean Sea meets Akumal's own treasure, Yalku Lagoon, you will see incredible waters of bright blues and emerald greens dotted with tiny islands. 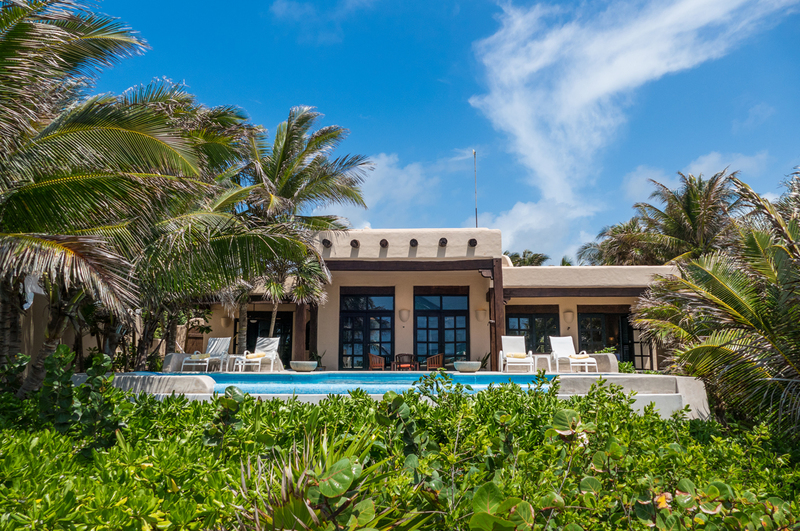 Villa Las Vigas is a luxury vacation home perched on one of the most amazingly private pieces of land in Akumal. 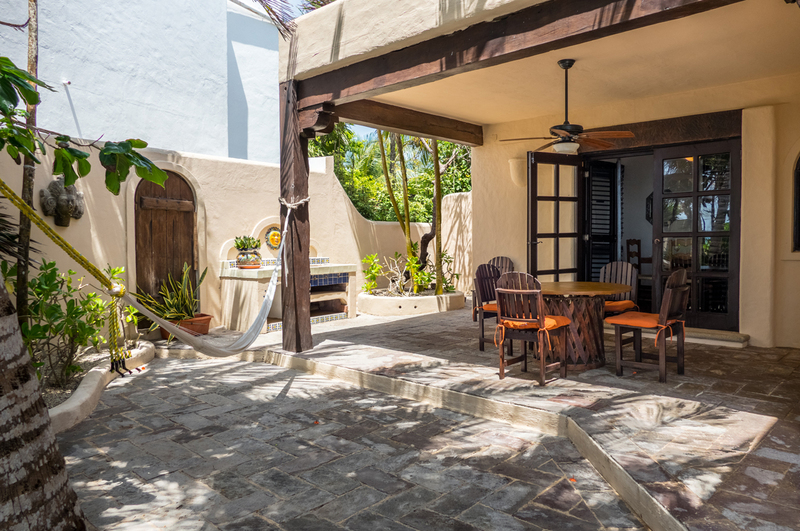 To allow for ample enjoyment of the Mexican Caribbean views, a partially covered patio runs along the entire oceanfront side of this Rivera Maya vacation home, providing sitting, dining, and lounging areas. 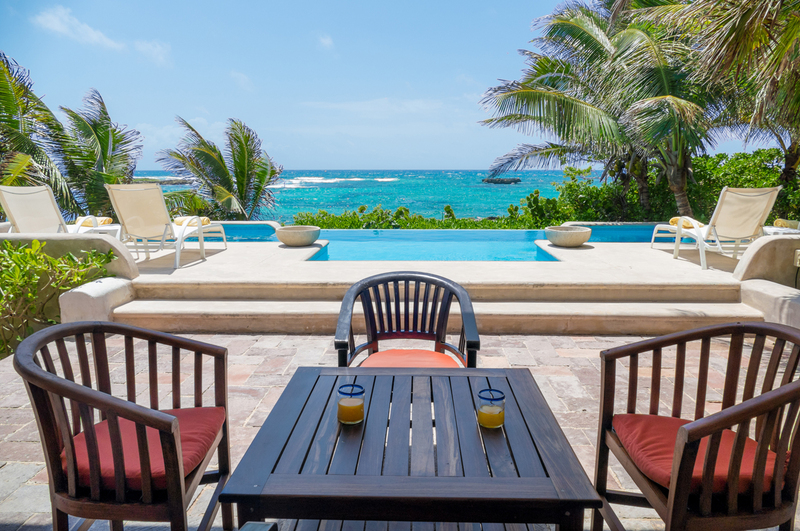 There are several chaises lounges around the 16x20 infinity pool making it the ideal spot for sunning. 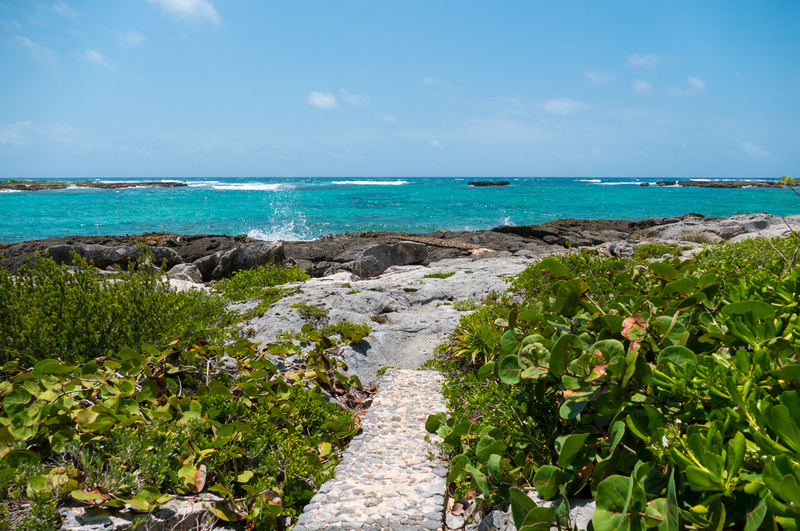 A winding cobblestone pathway gently guides you down to the water's edge. With steps and a small, cupped formation in the rocks, there is access into the water on calm days. 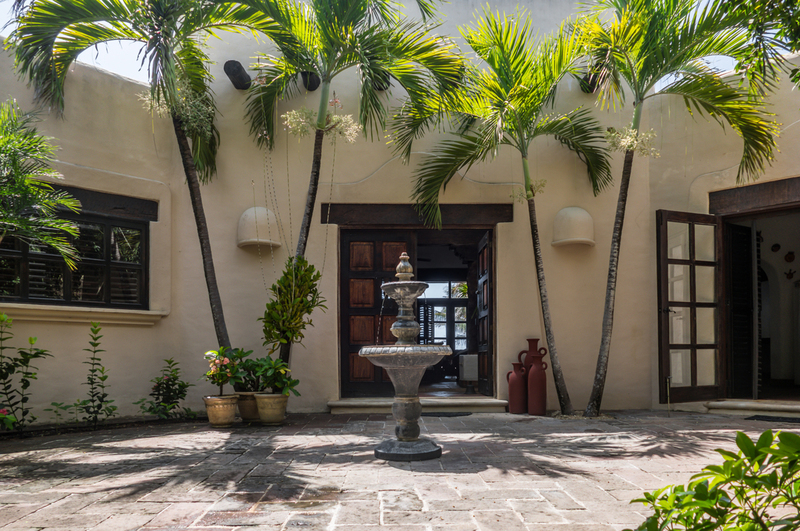 For star-gazers and the romantic at heart, take the opportunity to enjoy the roof-top observatory, accessed by stairs off the kitchen. 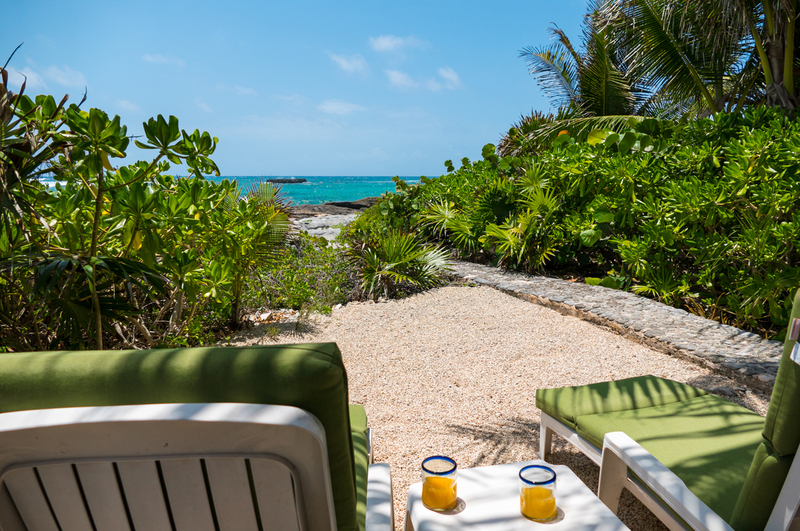 Falling asleep to the sound of crashing ocean waves is one of the best parts of vacationing on the Riviera Maya, and both bedrooms in this amazing vacation home offer this divine luxury! 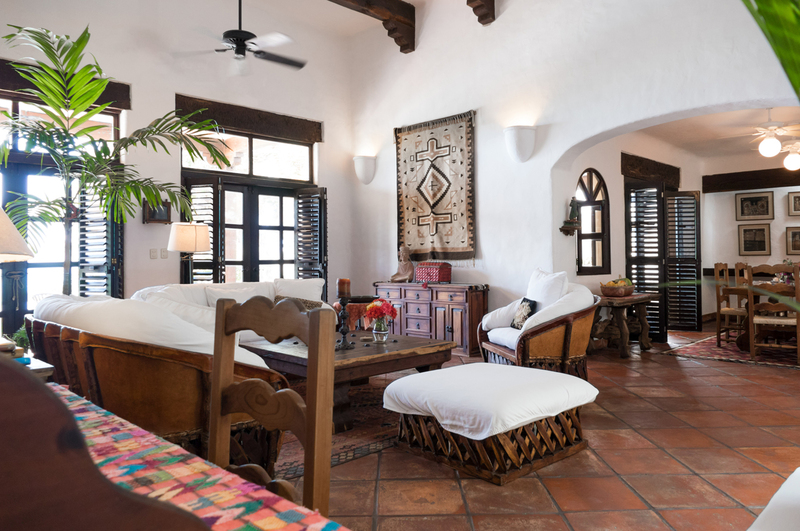 The dreamy master bedroom features a wall of windows to the Caribbean Sea, intricate wooden shelves and entertainment center, as well as an enormous talavera tiled bath with a glass walled shower. 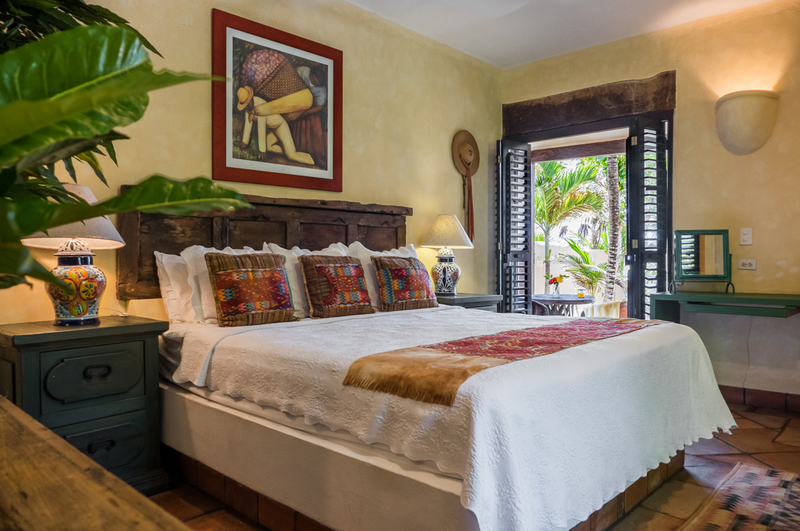 Hand-carved headboards made from antique Spanish doors complement the king size beds and are stunning focal points of both bedrooms. 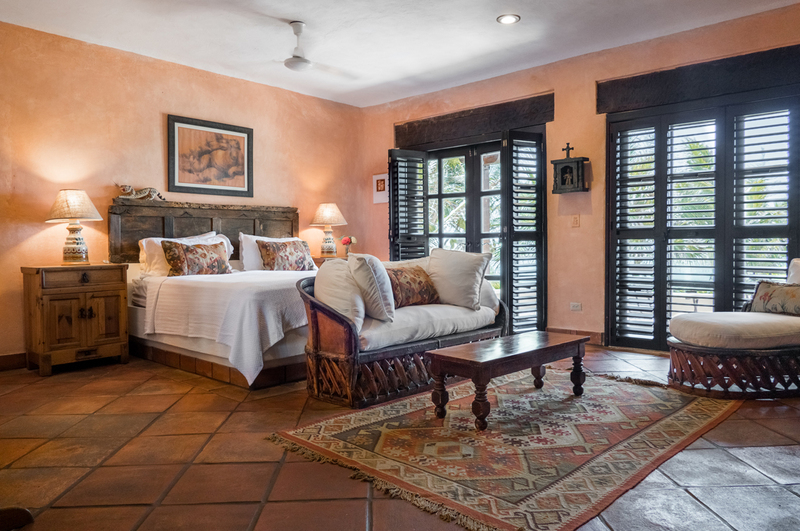 With a small, private patio tucked away at the side of the villa, the guest bedroom offers privacy and a gorgeous view of the ocean. 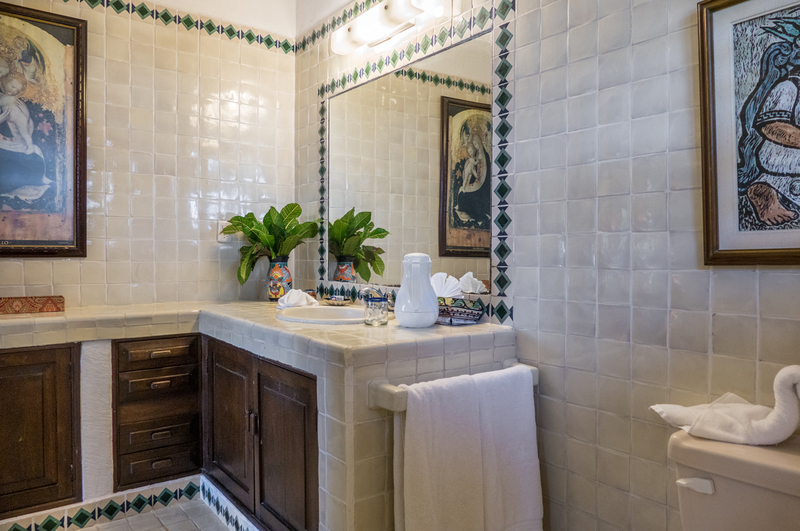 This bedroom is extremely spacious, with an oversized bathroom also done in traditional talavera tile. 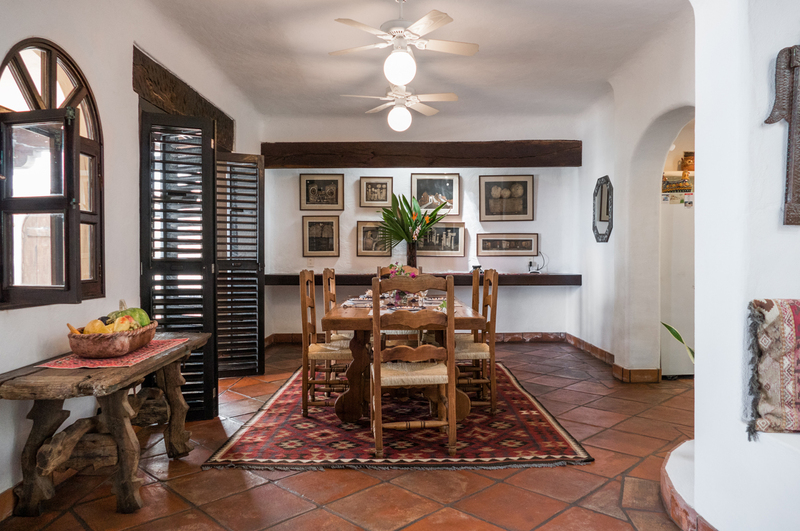 With large French doors to the Caribbean Sea, the dining room presents a magnificent Mexican carved wood table and chairs; a perfect complement to the motif of this vacation home. A series of skylights hidden behind an impressive wooden beam allow natural lighting to filter down and interact among exquisite pieces of art above a solid wood buffet. 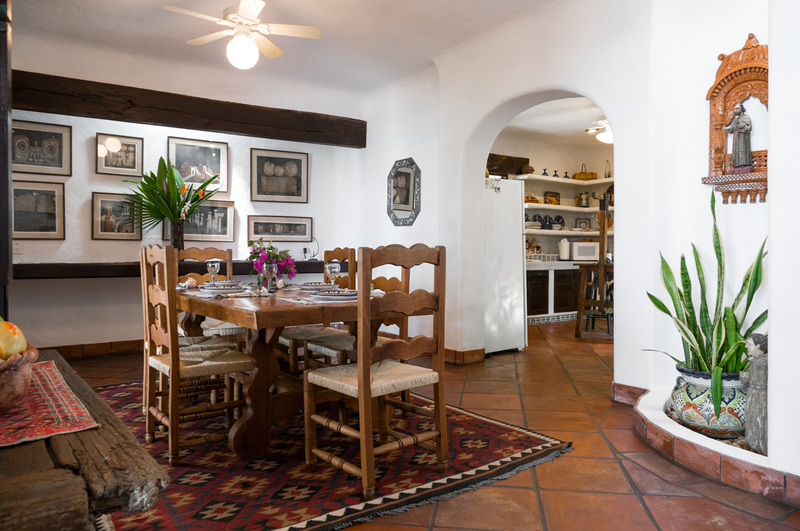 For those who love to cook, the spacious and well-designed kitchen of this vacation home will be sure to please. 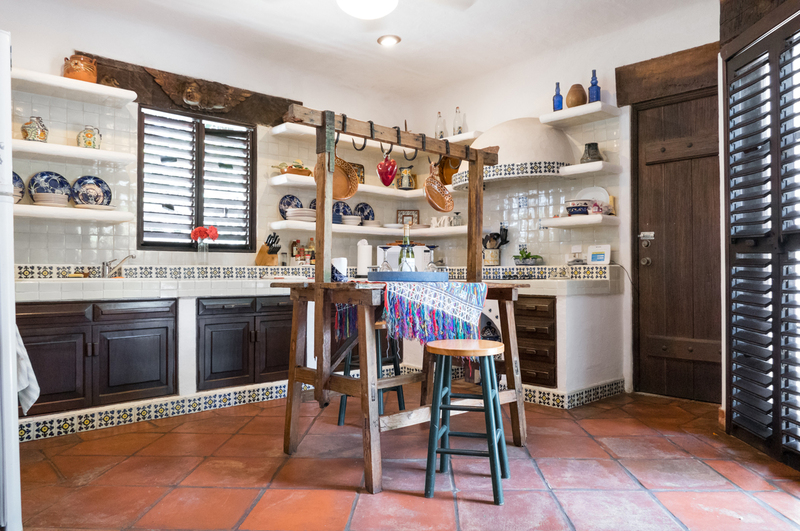 If cooking does not fit into your Riviera Maya vacation plans, try a traditional Mexican feast prepared for you and served to you in the privacy of your own Akumal villa! Sublime! 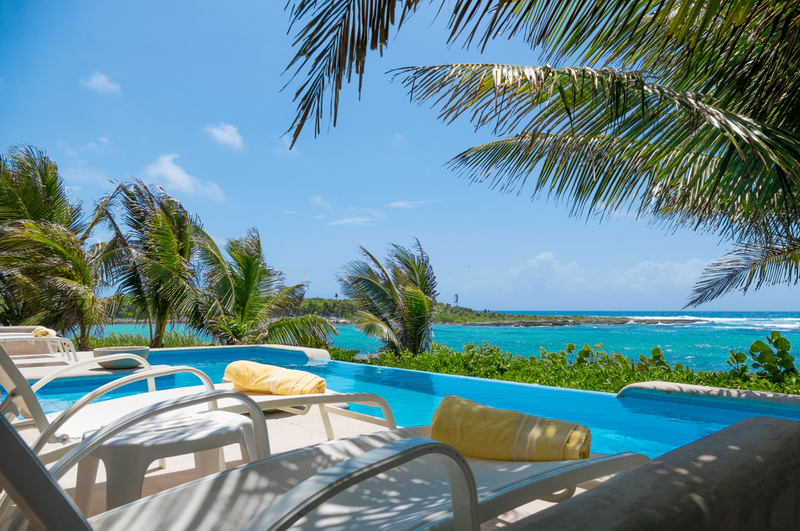 Villa Las Vigas is a romantic vacation home, tucked out of sight from any other villa with a stunning view of the Caribbean Sea. 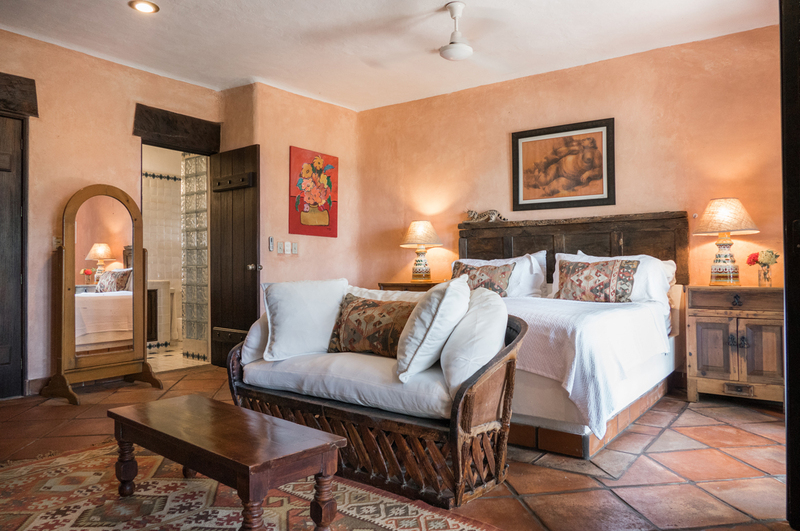 From a honeymoon in Akumal to an adventure-filled Riviera Maya vacation, Villa Las Vigas is the perfect vacation home for your holiday in Akumal. 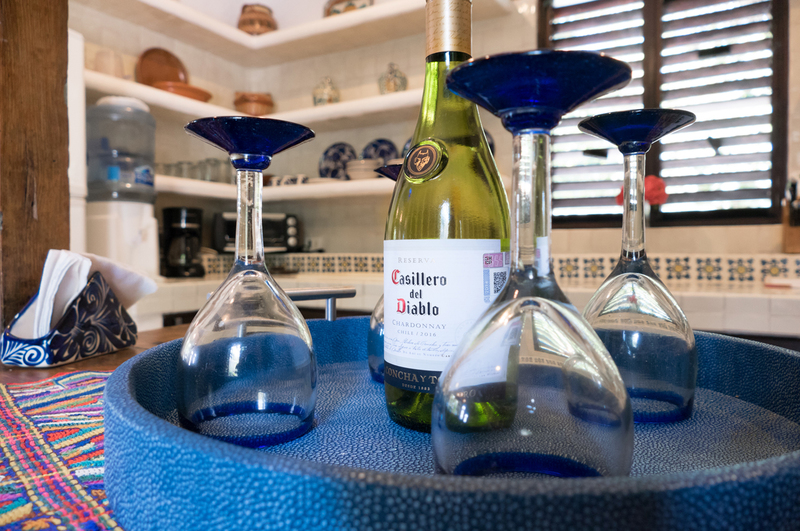 Villa Las Vigas allows only Saturday to Saturday bookings for February and March. 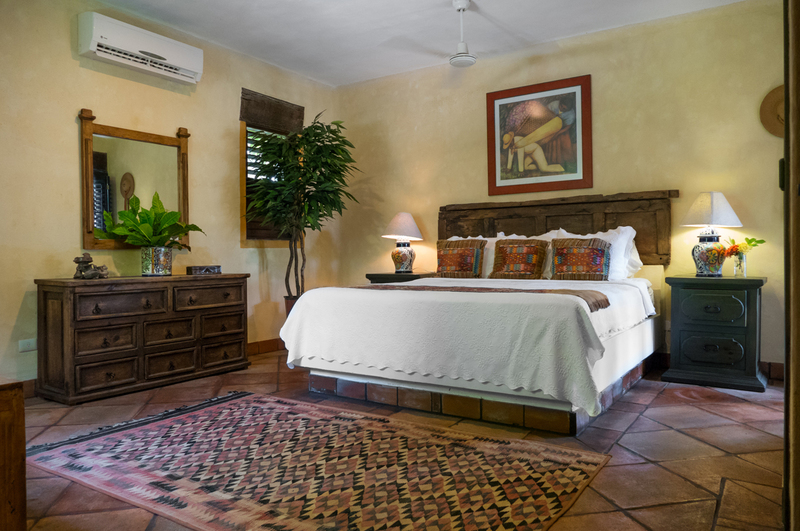 Las Vigas is located on the KalKu caleta with direct access to the caleta and ocean from the property. 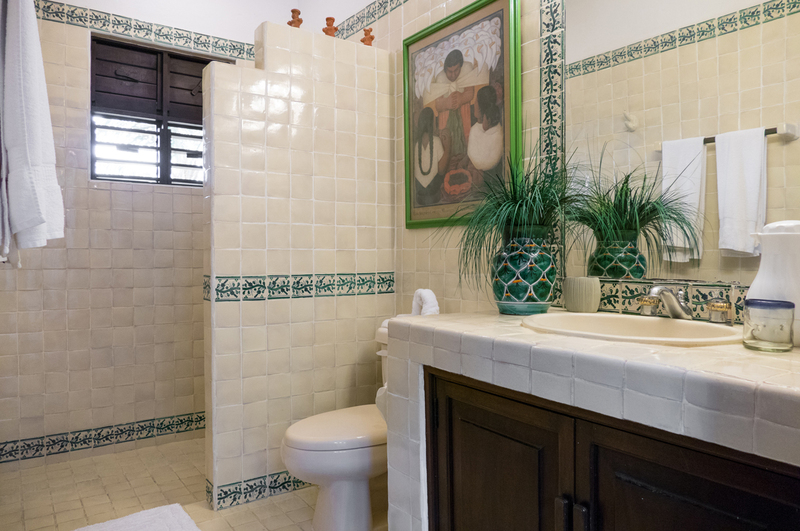 The property itself is extremely private due to the well stocked and maintained gardens. THe caretakers (Mercedes and Alex) are wonderful people, very friendly and helpful - Mercedes is also a wonderful cook - try her Cochinita Pibil. 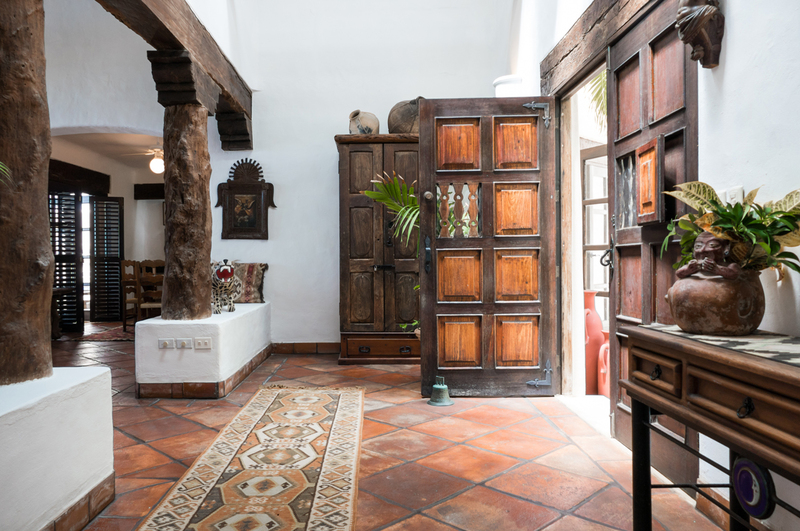 The villa itself has a very traditional Mexican feel which I enjoyed tremendously. I would recommend this holiday villa to anyone - at the end of our stay we were very sad to be leaving a wonderfully tranquil and beautiful place. For night time activities go up to the roof after dark, sit back in one of the loungers and stare at the sky on a clear night - the display provided by the night sky stars will amaze you. 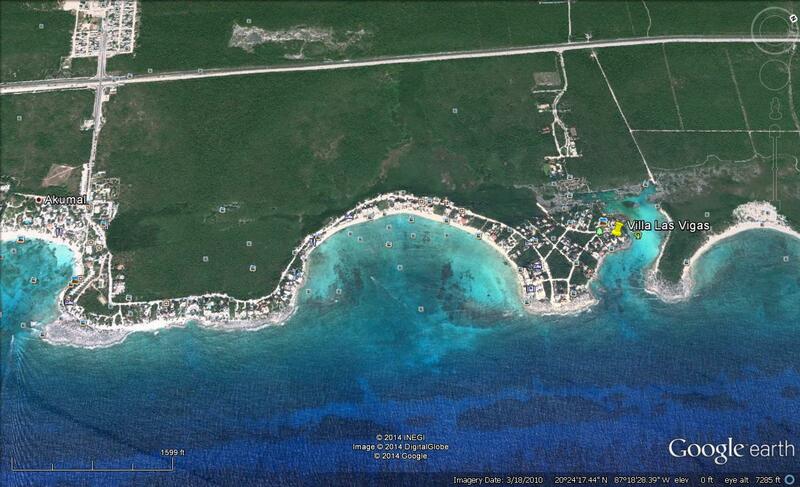 We are regular visitors to the Cancun/Riviera Maya area and will be back to this villa again soon. Ambivalent about spreading the word! 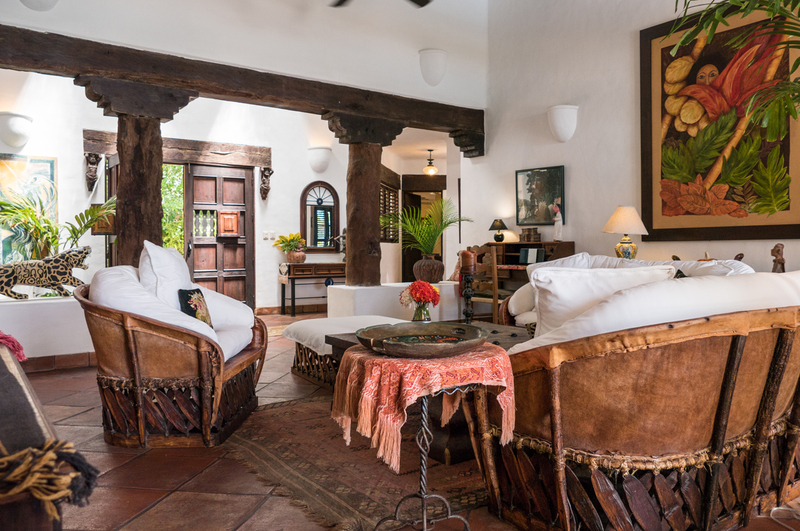 Villa Las Vigas is like a dream come true. We've stayed there 3 times now and will be back every year if we can swing it. We are ambivalent about telling our friends about the place... we're worried it will get booked up and we'll be shut out! This house is amazing! We had stumbled on this house a few years back and have been wanting to try it out for a while. Mari Jo was great in working with us to make our vacation at Las Vigas possible. Alex and Mercedes are awesome, super great people who will interact with you as much or as little as you want. The house is perfectly situated, I would recommend good shoes to access the ocean as the rocks are really sharp. Overall, I give the house a 10 out of 10. We were very impressed with the beauty of the house and the setting. The patio and pool area look like they would be in a magazine. It's very private...the views are wonderful. The snorkeling is so great right out front of the house. You can walk to town, or rent a bike for the week. There are also restaurants within walking distance. The caretakers are very comfortable, helpful, and friendly. We loved the meals they cooked, especially when they did the grilled fish on the patio. 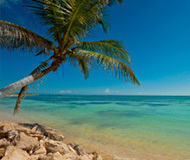 It is the nicest place that we've stayed in Akumal. I would go back in a second! Great villa and the staff were incredible (George, plus our maid / cook / gardener). We had a great visit and will definitely return--great value for the money as well!